What Is a PPTX File? A file with the PPTX file extension is a Microsoft PowerPoint Open XML Presentation file. These files are used to store slide show presentations. PPTX files use a combination of XML and ZIP to compress its contents. PPTX files can contain formatted text, objects, multiple slides, images, videos, and more. PPTX is the default presentation file format for PowerPoint 2007 and newer. The older version of the PPTX file is PPT, which was used in Microsoft PowerPoint 2003 and older. 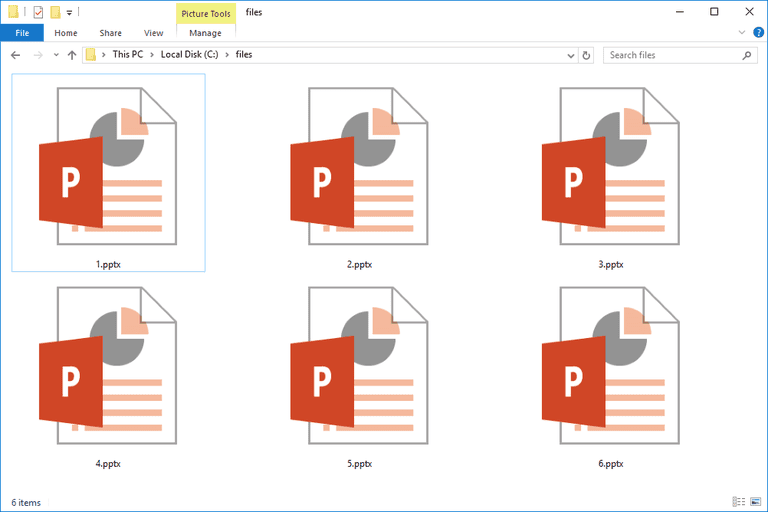 Microsoft PowerPoint's PPSX format is similar to PPTX except that it will open directly to the presentation while PPTX files open to the editor mode. If you have your hands on a PPTX file that you just want to look at and not edit, this can be done very easily with the free PowerPoint Viewer program available from Microsoft. You can't edit the slides or make changes to anything like you can with a full version of Microsoft PowerPoint, but it's a lifesaver if you just need to flip through a PPTX presentation someone sent you. To open and edit PPTX files, without having a copy of Microsoft PowerPoint, is doable with either the free Kingsoft Presentation or OpenOffice Impress presentation tools. These are just two of several free Microsoft Office alternatives that fully support PPTX files. There are also some free presentation makers that can import PPTX files for editing online — no need to install any software. One of them, Google Slides, lets you upload a PPTX file from your computer, make changes to it, and then either keep it in your Google Drive account or download it back to your computer as a PPTX or some other format like PDF. Google also has this free browser extension that works as a PPTX viewer and editor that runs right inside the Chrome browser. This works not only for PPTX files you drag into the browser from your computer, but also for any PPTX file you open from the internet, including ones you might receive over email. That browser extension also works with other MS Office formats like XLSX and DOCX. If you want to extract images from the PPTX file, you can do that with a file unzip tool. Use one of those programs, such as 7-Zip, to open the PowerPoint file as if it were an archive, and then navigate to ppt > media to see all the images that were imported into the slide show. You can copy out any pictures you want to extract from the PowerPoint file. If you're using one of the full-support PPTX programs mentioned above, you can easily convert your PPTX file to another file format by just opening the file in the program and then re-saving it under a different format. In most programs, this is usually done via the File > Save as option. Sometimes, a much faster way to convert a PPTX file is with an online file converter. One of our favorites for converting PPTX files is Zamzar. You can convert PPTX to PDF, ODP, PPT, and a number of image formats, too, like JPG, PNG, TIFF, and GIF. A PPTX file can also be converted to a format that Google Slides can recognize. Just upload the file to Google Drive through the New > File upload menu. Right-click the file in Google Drive and then click Open with > Google Slides to convert it to the Google Slides format. Once the PPTX file has been converted to Google Slides, you can open it there in your Google account and convert it to other formats via File > Download as. These formats include PPTX, ODP, PDF, TXT, JPG, PNG, and SVG. If you want to convert the PPTX file to an image format for the purpose of getting one of the photos out of the slide show, see the 7-Zip instructions above for an easy method. If your file doesn't open with the suggestions from above, make sure you aren't confusing the file extension with something that just looks similar. For example, the PTX file extension might look similar to PPTX but those types of files don't open with the presentation programs described here. A similar example can be seen with Serif PagePlus Template files that use the PPX file extension. It's really easy to think that a PPX file is the same as a PPTX file when you look at just their file extensions, but PPX files are actually used with the PagePlus program. If you double-check the suffix for your file and find that it in fact does not read ".PPTX," then research what it does say to learn more about the file format it might be in and which software programs are capable of reading, editing, or converting it. What's a CV File and How Do You Open One?